Lotus Blossom Tank KAL: Oops! If victory tastes sweet, what does defeat taste like? Somewhere about Row 9 (around 11:00 P.M. last night) I made a mistake. I've spent the past three hours trying to figure out what it was, but no dice. No matter how much I want to resist, I'm going to have to F-R-O-G. Bummer. Love the pattern--the lace repeats are pretty easy to memorize (although I think I missed a couple of yarn overs while knitting so late at night). The Frog Tree cotton/silk blend is very nice, smooth, and silky, but a little splitty, and too slippery for my Denise needles. 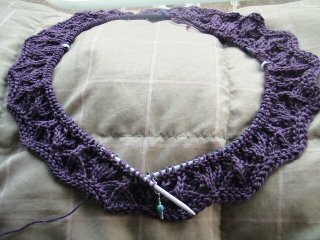 I think I'll search for my bamboo circulars before I cast on with this yarn. The recommended 24" circulars are too small. I'm knitting the smallest size, but my stitches still feel really cramped. The 29" length is probably much better. Anyway, there it is. Hope you all are having better luck. I look forward to seeing photos of your progress. Soooo frustrating, I know because I just did the same thing! oh, how frustrating. I usually try to fix as I go along, but sometimes it's just too far gone, and frogging is the only option. Good luck getting it going again! Very frustrating. I could have reknit the whole thing in about the time it took to search for my error(s)! LOL. No worries. School it out next week, so I have the whole summer to knit. Put a fork in me! Racing to the finish line! The Lotus, she has Blossomed! Do I have everyone listed? I've made progress on Lotus Blossoms! Sizing Question - Please help!! Welcome to the Alien Head KAL!